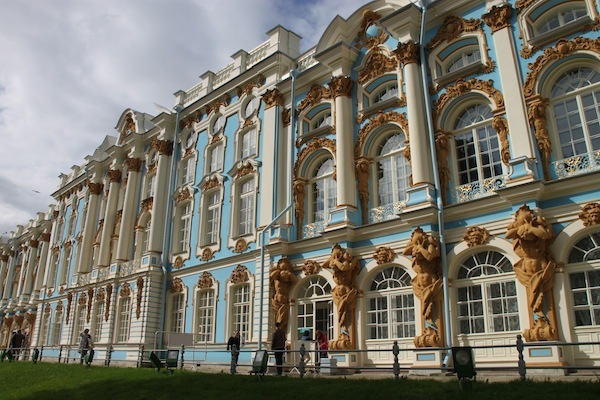 Built for Catherine I, Peter the Great’s second wife, Catherine Palace was redesigned to its current grand style in 1756, burned by the Nazis and is still under restoration. Of the palace’s 59 rooms, 36 have been restored. The palace is in Pushkin Town, originally named Tsarskoye Selo, or Tsar’s Village, in the suburbs south of St. Petersburg. This palace requires a lot of gold for its decor — 100 kilos (220 pounds) of gold, our guide said. We walked through numerous public rooms and some that provided private space for the royals. The truly grand Grand Hall in Catherine Palace. The aptly named Grand Hall, a ballroom, is grand based on size and over-the-top application of gold in its decor. On our second pass through the room, our group observed a couple in period costumes, ready to pose for photos with visitors for a price. We grabbed a few shots anyway. I wonder how one gets a concession to stand around charging for posed photos in a state museum. 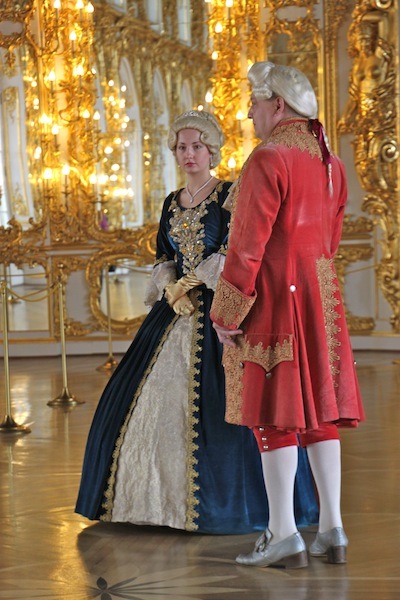 Couple in period costumes ready to pose for photos with tourists, for a price, inside Catherine Palace. They are in the Grand Hall. 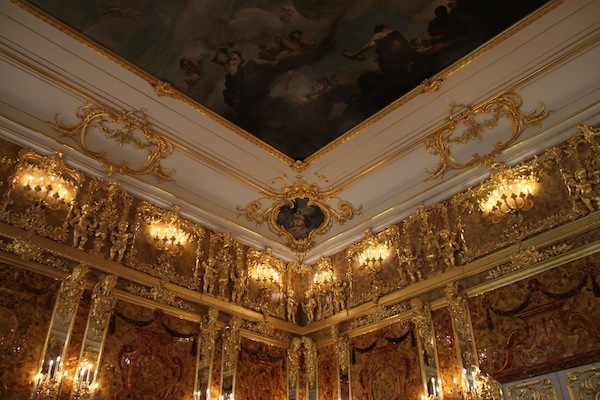 The most exotic room is the Amber Room. Amber of different shades was used to cover the wall with mosaics. Even furniture was inlaid with amber. Semi-precious stones were used for a mosaic floor. Our guide called it a jewel box. It certainly is an eyeful. 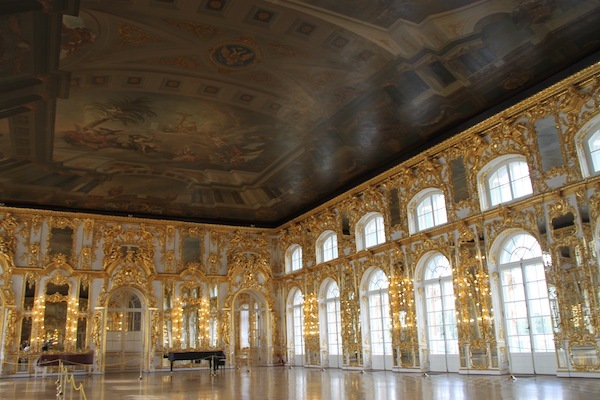 The Amber Room, lined with ornate panels of amber, inside Catherine Palace. During World War II, the Nazis stripped the room and carried the amber away, never to be seen again. In 1979, the Soviet government set out to restore the room with new stone. This took until 2003 and cost $11.5 million, including a $3.5 million contribution from Germany. Restorers worked with black-and-white photos. And, then, there is the Picture Hall, so named because 130 oil paintings cover the entire wall space, effectively functioning as the room’s wallpaper. 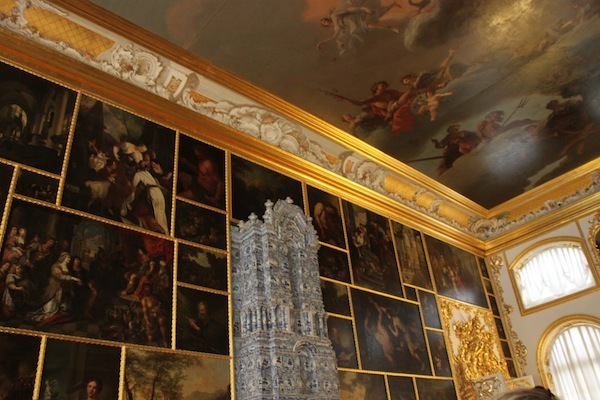 The Picture Hall, with original oil paintings covering the walls, functioning like wallpaper, inside Catherine Palace. As for shops at Catherine Palace, there was a lot to choose from — it would require some serious time to consider everything carefully, and the goods carried serious prices, too. Less costly choices were available outside where tourists exit the palace. Merchants manned a row of stalls where one could spend still more serious time. We did not have that kind of time, to say the least. Pushkin Town often is still called Tsarskoye Selo, the old name. 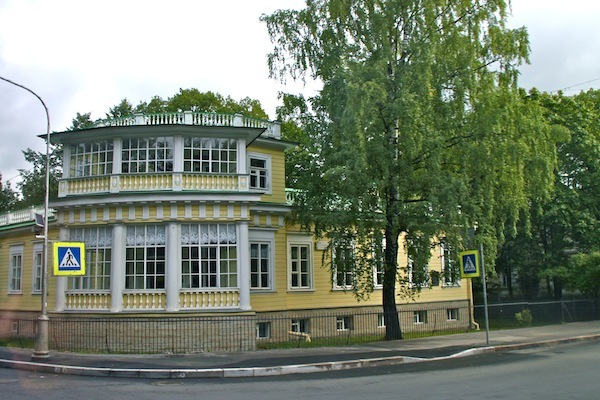 After the Russian Revolution, it was known as Children’s Village because this and other palaces in town were used as homes for children; in 1937, it was renamed Pushkin Town because the poet Alexander Pushkin had lived there and loved it. A house was pointed out to us as his dacha. The dacha where the 19th century Russian poet Alexander Pushkin lived in Pushkin Town, formerly Tsarskoye Selo, or Tsar’s Village.